"Guess we're going to have to end the world"
Ryan has been followed by a mysterious figure his entire life. One day, he finds a small black stone - a nanoverse - and in short order finds out he is now a god. Specifically the Eschaton, meaning it's his job to end the world. Then things start to get out of hand. 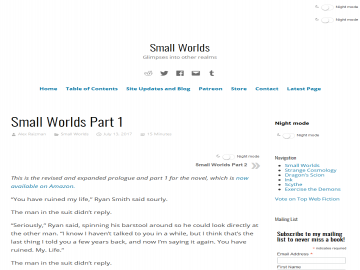 Small Worlds has not been reviewed yet. Small Worlds has not been recommended yet.